Last week, I covered five Kickstarter campaigns for games that look really promising. I’m happy to report that most of them are fully funded, with the campaigns for Realms Beyond and The Waylanders having already concluded. 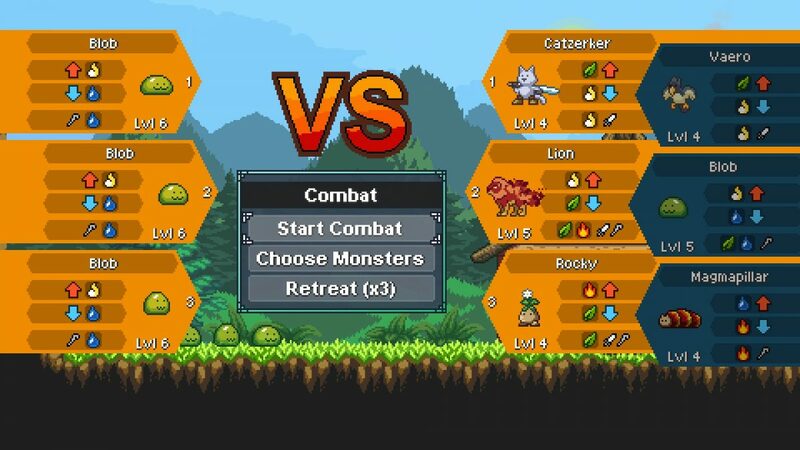 Today, I’d like to take a closer look at Monster Sanctuary by Moi Rai Games, one of two games in the article that has a playable demo. Here’s my brief first impressions, based on around two hours of playtime. 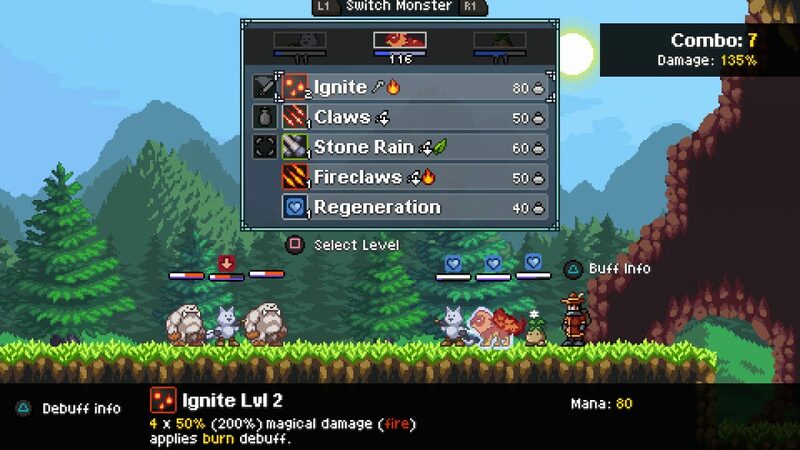 Monster Sanctuary is a side-scrolling 2D monster taming RPG with some light Metroidvania elements. As with most monster taming RPGs, you play an aspiring trainer (called a Monster Keeper here) setting out for adventure in a fantasy realm with your first monster companion. You start out by picking one of four dual element monster familiars that serve the ancient Keeper bloodlines that help guide new aspirants. Unsurprisingly, the other three familiars will be used by rival Keepers that you’ll interact with throughout the game. There’s a bit more to the story beyond just training to be the best Monster Keeper, however. Champions, once a rarity among the wild monster populations, are becoming disturbingly common and launching attacks against the more remote human settlements. These Champions serve as the game’s boss encounters, and defeating them is key to climbing up the ranks of the Keepers. Combat comes in the form of turn-based encounters that are usually 3v3. You can bring six monsters with you at a time, and will have a chance to swap around your party and positioning before battle. Positioning doesn’t matter a whole lot outside of a few corner case scenarios, like some team buffs that add an extra effect to a monster in a specific position in the party. I imagine that there will be more abilities in the final version to make positioning matter a little more than it currently does. The combat system is fairly straightforward, and anyone familiar with turn-based RPGs will pick up the basics pretty quickly. Each monster has a basic attack, but you don’t want to be using it unless you absolutely have to. Your main source of damage will be your special abilities, which all consume mana. Monsters regenerate a set amount of mana at the beginning of their turn based on their mana regeneration stat, so unless you are spamming really expensive abilities, you generally won’t have to rely on your standard attack too often. There’s a fairly standard elemental system in place as well. All monsters have an elemental strength and weakness, which usually consist of fire, water, earth, and wind. There’s no sort of initiative system in the game. Rather, whenever its your turn, you can choose to activate your monsters in whatever order you want. This is important because of the game’s combo system. Essentially, each ability will empower the next ability based on the number of hits. Most attacks do a certain number of hits, so sometimes its better to use a weaker attack that hits multiple times over a stronger, single hit attack to build your combo meter. This includes healing and buffs, so typically you’ll cast your support abilities first and save your main damage dealers for the end of the turn. Speaking of which, buffs are another really big part of combat. Every monster has some sort of buff ability, many of which target your entire party. These can be everything from increased defense, a shield that protects from the next X amount of damage, health regeneration, and more. 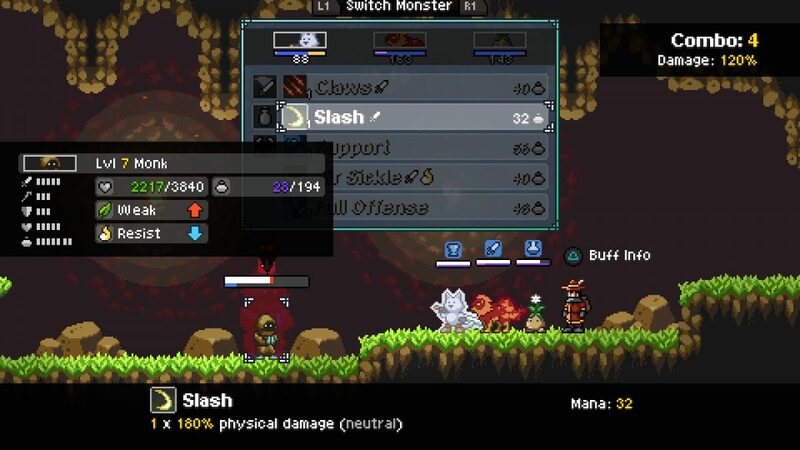 Some monsters even have a passive buff that effects your entire party as long as the monster is in battle. You are graded after each battle using a five-star rating system based on the amount of damage taken, overkill damage, monster levels, and how quickly you won. The higher the rating, the better your chance of getting rare item drops, the most desirable of which are monster eggs that can be hatched into new monsters to add to your party. You can also give unwanted eggs or monsters to the Keeper Sanctuary for rewards. There’s also a system about the Keepers raising a monster army based on your donations, but the demo doesn’t go far enough for this mechanic to mean anything yet. There’s a fair bit to the min-maxing and progression of your monsters as well. 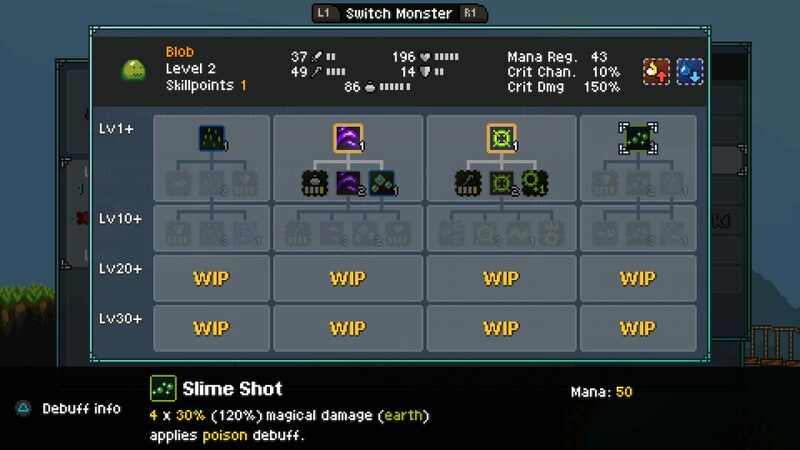 Leveling a monster up grants a skill point that can be spent on one of several skill trees. These can grant passive effects, new abilities, upgraded versions of exiting abilities, and more. More of each tree is unlocked as the monster hits certain level thresholds. Monsters also have item slots consisting of one weapon and three trinkets. How a small bird creature wields armored punching gloves is a bit confusing, but we’ll go with it. Your weapons and trinkets can be upgraded at the Keeper Sanctuary using upgrade materials found in chest or dropped as rewards. 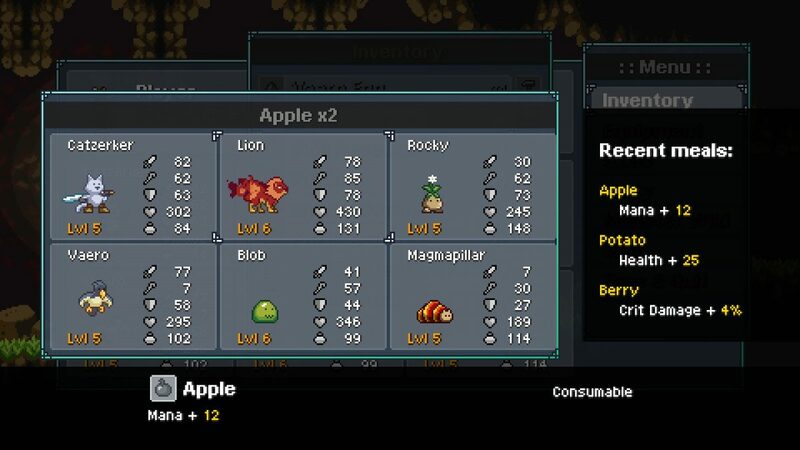 You can further tweak your monsters using the meal system, which allows you to give small buffs to your monsters by feeding them various treats. These range from max health and mana boosts, stat increases, and more. A monster can only benefit from their previous three meals at and given time. I briefly mentioned earlier that Monster Sanctuary is a Metroidvania-lite as well. This is because each monster has a noncombat ability that can be used to overcome obstacles. 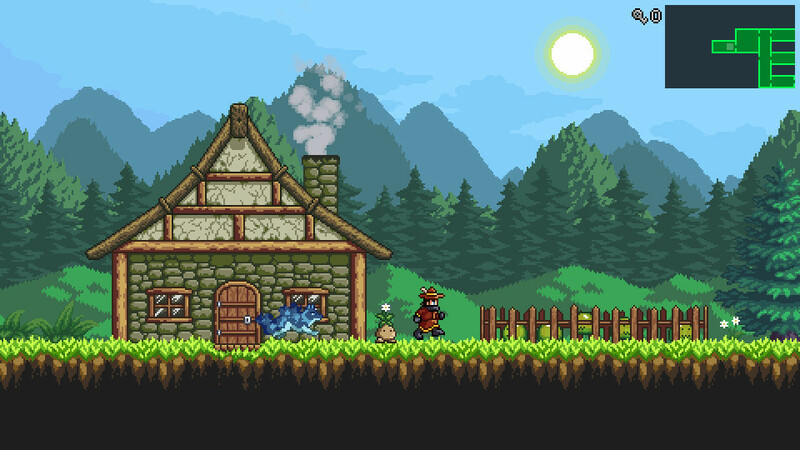 Like many 2D Metroidvanias, the environments in Monster Sanctuary are full of hidden areas and different types of barriers. You might need to burn some vines to proceed in one area, or maybe there is a chest on a floating platform that requires a flying monster to reach. There’s quite a bit of overlap between the various abilities to ensure that you don’t need specific monsters, but either way you’ll need to consider what sort of obstacles your current party can deal with when choosing which monsters to bring. Monster Sanctuary is still very early in development, so it’s too early to make any definitive statements on where the game needs improvement and which features should be implemented. Indeed, the Kickstarter page has an estimated launch of October 2020, though there will be an Early Access version sometime next year. Based on my two hours with the demo, I’d say that there’s already a good foundation for the developers to work with here. Should all the stretch goals be met, Moi Rai Games is looking to ship with over 100 monsters, many of which will have an alternate light and dark version. The combat so far is pretty fun, and there’s a decent amount of depth and nuance to figure out. I do feel that some of the monsters and their standard names are a bit on the bland and generic side, but not even a fraction of the final game’s monsters are in the demo to make a call either way. The Kickstarter campaign for Monster Sanctuary will end on Thursday, November 22nd. The minimum pledge required to get a digital copy of the game is $17. You can check the demo out on the game’s Steam page if you want to give it a try yourself.